SyncToy for Windows XP is a simple bit of software from Microsoft that fits the bill for my home PC backups. 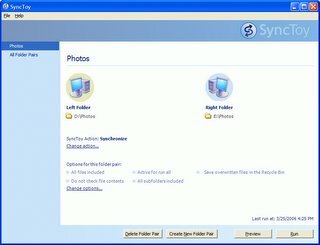 Give it any number of folder pairs, and configure how you’d like the two folders to remain in sync. There are 5 different synchronisation methods, each differ in the way they treat deleted/modified/new files. For example; to back up my digital photos I have a D:\Photos folder and an E:\Photos folder on two different physical disks. I can configure sync toy to keep the two folders in sync, and I’m protected from a hard disk failure. The sync doesn’t happen automatically, which is something I like about it. Alternatively there are instructions on how to use the Windows Scheduled Tasks to schedule recurrent SyncToy runs. If I got really keen I could set-up folder pairs to sync everything I’d want for a rebuild (installers, coding projects, documents, bookmarks, photos, etc) with an external HD. I’ll have a back-up and rebuilding my PC would be infinitely easier. Just experimented synchronising with a CDRW. When you select the CD drive from the folder dialog the folder actually selected is in %USERPROFILE%\Local Settings\Application Data\Microsoft\CD Burning. If you try manually typing the CD-ROM drive name, you get an error telling you to ‘make sure external devices are attached’. The first time you attempt to synchronise, the files get delivered to the “CD Burning” folder, and you get the disk burning pop-up. Everything gets burnt to the disk okay. But second time around the “CD Burning” folder is empty – so SyncToy attempts to copy every file again, and you get an error when you try burn the CD. Everything does work okay if you first format the CDRW, which I could put up with. Ideally it’d be great if SyncToy itself could handle the CD burning process, and support spanning disks. Otherwise I’m very happy with this little discovery. Thanks to Ellecer for getting me onto this! Posted by russ on Saturday, March 25, 2006, at 5:17 am. Filed under utilities. Follow any responses to this post with its comments RSS feed. You can post a comment or trackback from your blog.